All Products Made In The USA of material specified by Husky to work best in their machines. Husky Injection molding systems supplies machines for any part and process. They specialize in containment style molds for the injection molding with both the hydraulic and electric style machines. The machines are designed to preform best with container and high speed applications. We supply the replacement Husky injection molding barrels, as well as the shooting pots and pistons. Everything is designed with the close tolerances needed to work with in the higher speed application that suit the machine. We try to stay away from nitride in these application to keep away from burning from sheer , sticking issues and degrading the material. 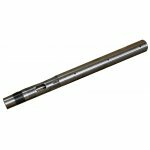 After market injection molding barrels follow a different specification and in most cases made off shore of sub-standard material. It is not worth the production loss or the down time of the machine for the few dollars saved in buy a non-OEM specification injection molding barrel.